Native to China, North and South Korea and Japan, Japanese Knotweed was brought to the U.S. as an ornamental plant and has since taken over many of our waterway banks. While considered invasive, it is also a wild spring edible and has many medicinal properties, and is especially known for its ability to support those with Lyme Disease. Lyme Disease is complex to treat and an experienced herbalist is recommended for those working on Lyme protocols, especially as our understanding of it is constantly evolving. A broadly systemic plant, Japanese knotweed root modulates and enhances immune function, is anti-inflammatory for both arthritic and bacterial inflammations and protects the body against endotoxin damage. It enhances blood flow, especially to the eyes, heart, skin, and joints. This makes it especially useful in Lyme and its coinfections as it facilitates blood flow to the areas that are difficult to reach to kill the organisms. The plant’s compounds easily move across the gastrointestinal mucosa and circulate in the bloodstream. Check out herbalist Stephen Buhner’s books or website for more information, or see herbalists Bonnie Bloom or Chris Marano. We harvest the root in the spring and tincture it fresh. It has a very hard root, so be sure to chop the root immediately into small pieces to tincture. We recommend using hand clippers or even pruners. 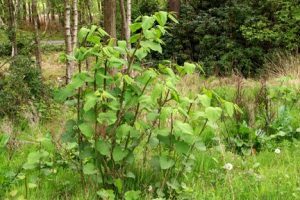 Japanese Knotweed could be made as a decoction but is best used as a tincture. Cautions/Contraindications: Take caution with pregnancy.